Decades after a rock church in communist Romania's Carpathians caved when an expedition caused a landslide and buried everyone, Dr. Nicolai's scientific team exploring the associated Templar Knights monster fighting-legend discovers a deep, flooded cave system and hires the brothers Jack and Tyler's brilliant divers team to explore it. Another explosion traps them, after finding a mysterious parasite turning all species carnivore, and later an independently evolved predator species. Jack may be infected and turning, but Tyler sticks with him, so the group splits, hunted by the monsters, which also fly. Bloodthirsty creatures await a pack of divers who become trapped in an underwater cave network. Well, I have to say that this movie was.....okay. As another writer commented it wasn't a great horror movie, but I didn't leave mad for wasting my money on it either. I prefer creature suit/puppeteer monsters to CGI ones. This movie had both and enough live action to keep me interested. The "if there's a scary monster in the cave why don't they just LEAVE?" question was effectively handled by the cave-in. The characters weren't that interesting, but then I don't see monster movies for the characters anyway. You want plot and character development, see "On Golden Pond." It reminded me of "Pitch Black" and "The Relic," although it is inferior to those movies in my opinion. To be honest, the thing that made my husband and I most uncomfortable were the underwater cave-diving scenes. I think I would rather take on a winged mutant than squeeze through a dark underwater crevice any day. That's probably why I work at a desk. 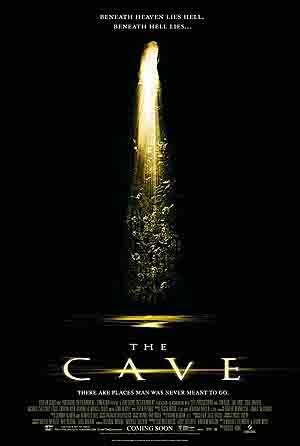 "The Cave" is a film which is almost predicted to be a flop. Looking at the cover and reading the plot, gives you an extremely average impression of what this is all about. But it is not that awful at all; actually it is quite enjoyable as an action film. But it is only action - not much horror! Unfortunately it never gets scary at all, which is the major failing, and "The Cave" never becomes more than just an average action movie. Sadly I can't give more than 3. A much better "cave" movie, would be "The Descent", which also is reviewed by me.